The FEPE International Congress in Sorrento was held June 6th to 8th 2018 and was our biggest yet. Over 400 attendees from 40 different countries joined us for 3 days of high quality presentations from a variety of top level speakers. The 59th FEPE International Congress in Sorrento last week was the biggest to date with over 400 delegates from all over the world including a major delegation from China for the first time. Was it also the best? Reflecting a global industry isn’t easy, especially as FEPE (probably uniquely among such advertising associations) represents all sides of the industry: media owners, agency specialists and the many technology companies and other suppliers now occupying this desirable space. Two main themes emerged: early in proceedings FEPE President Tom Goddard of Ocean Outdoor and former Posterscope Global President Annie Rickard both emphasised the need for collaboration ahead of competition, the need for the industry to find a way of combining the various digital platforms on offer to offer advertisers a seamless way to reach a global audience. This is an ongoing theme at FEPE and Goddard said it was time for real progress to be made. Elsewhere the linked challenges of programmatic and automation in digital were discussed, notably by Talon Outdoor CEO Eric Newnham and Ströer Co—CEO Christian Schmalzl who made it clear that there was much work still to be done before automation in particular played a major role. Newnham emphasised that it was vital for people with Out of Home experience to drive these changes otherwise they might be hijacked by others and the industry could be presented with systems it neither wants nor needs. There was much to celebrate too of course. The FEPE Awards (see here) are bigger and better than ever, with many outstanding entries in the twin creative categories of Classic and Digital. Outstanding talents from the industry were celebrated including, for the first time Rising Stars. The late Dennis Sullivan was awarded the Lifetime Achievement Award in what was an emotional moment for everyone. BT Chief Procurement Officer Hari Sundaresan, responsible for billions of pounds of expenditure on cables and kit as well as marketing, gave a fascinating insight into how his company worked; in particular that it sought to work in partnership as far as marketing and media were concerned. World Federation of Advertisers President and RBS CMO David Wheldon gave a masterly tour d'horizon of the many issues facing the marketing industry globally including the vexed question of media rebates. Referring to a conversation with America's Association of National Advertisers about media owner rebates to agencies, he recalled asking politely: "Don't you know how the media industry works?" The extraordinary impact of the OOH medium was amply demonstrated by Ocean Outdoor’s Tim Bleakley in his presentation on the iconic new Piccadilly Circus Lights in London and by Wang Huanzhang, General Secretary of China’s Outdoor Advertising Branch, as he showed delegates the extraordinary visual spectaculars now seemingly commonplace in China’s major cities. A linked theme, which will doubtless return, is the ongoing challenge of persuading creative agencies to to make better use of the digital medium’s massive potential. Congress also heard updates from Japan, Fabrizio Du Chène de Vère of IGP Decaux in Italy, a true FEPE pioneer and Gabriel Cedrone, CEO of Grupa Vallas a major media company with a presence in 12 Latin American countries and also the US and Canada. Gabriel is the first President of the Association Latino Americana Out Of Home (ALOOH), the new trade body for Latin America. He joined representatives from other National Associations meeting outside the Congress programme at the National Associations Meeting to introduce ALOOH, a major step forward for the OOH industry and FEPE worldwide. As significant as the Congress programme was the new forum for exhibitors - at Sorrento in record numbers - introduced by a “Speed Dating” process whereby FEPE directors, the leaders of major companies and others spent ten minutes with each of the exhibitors discussing their products and services. The event, which was introduced last year in Stockholm, proved hugely popular with other delegates joining in as they arrived in Sorrento. All orchestrated by FEPE Executive Director Bob Wootton, armed with a whistle. If FIFA runs out of whistle blowers in Russia then Wootton’s their man. 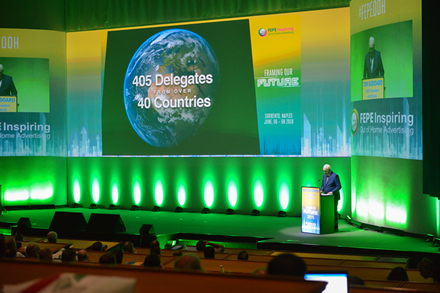 There was much more besides in a packed Congress programme plus, of course, the many invaluable networking opportunities for a global industry coming together, uniquely at FEPE. So was it the best FEPE Congress so far? We’d like to think so but need feedback from delegates to discover what the most important people think. Next year FEPE celebrates its 60th birthday, in Dubai from May 1 to May 3. We hope it will be be bigger and better than ever.